Once at Jodrell Bank they selected me to be the 'volunteer' to put his hand in the flask of liquid nitrogen which was steaming at extreme sub.zero temperature. Having already seen tennis balls break like crockery when thrown to the ground I was obviously a bit apprehensive. Fortunately I survived the experiment intact. Great memory to have pictured! An impressive photo of "fame" quietly lingering side by side. A great memory. 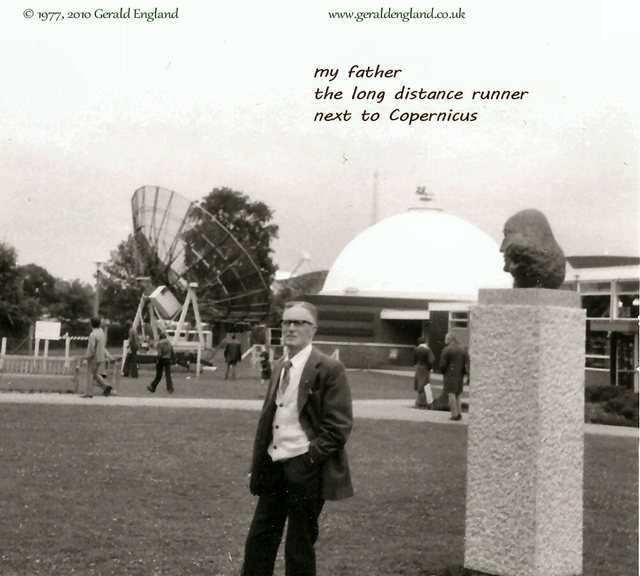 Gerald, your father still looks very fit here. Fine photo of him at a famous science center. Wonderful portrait of your father. What a great photographic memory! Love the vintage BW shot and wonderful haiku!